You probably know that on September 6, 2017 category 5 Hurricane Irma slammed into St. Thomas, USVI as the strongest storm in open Atlantic basin region history. Fourteen days later category 5 Hurricane Maria, the 10th strongest storm in recorded history, clipped St. Thomas on its way to pounding into Puerto Rico. These unprecedented back-to-back storms had a devastating impact on the Territory. What you may not know is that in the weeks prior to the storms tens of thousands of dollars and hundreds of hours were invested into a research project to track the movements of juvenile Caribbean hawksbill sea turtles and other marine animals in Brewers Bay. The National Science Foundation’s VI-EPSCoR program, Lana Vento Charitable Trust, University of the Virgin Islands (UVI) researchers and many UVI Masters of Marine and Environmental Studies (MMES) students had invested heavily in this project. The team feared expensive acoustic sensors and their hard work were lost along with the hawksbills that called Brewers Bay home. Hawksbill sea turtles are one of the most endangered of the seven species of sea turtles in the world. Two endangered sea turtle species are studied in Brewers Bay, the hawksbill and the green turtles. The hawksbill are listed by the International Union for Conservation of Nature (IUCN) as critically endangered which means the species faces a real threat of becoming extinct in the wild. Dr. Paul Jobsis, seen above in red, shows a juvenile hawksbill sea turtle to participants of a recent Turtle Tagging event. For many, this is a s closed as they will get to a sea turtle as regulations are extremely restrictive. All work with turtles by UVI researchers are conducted pursuant to a NFMS permit. 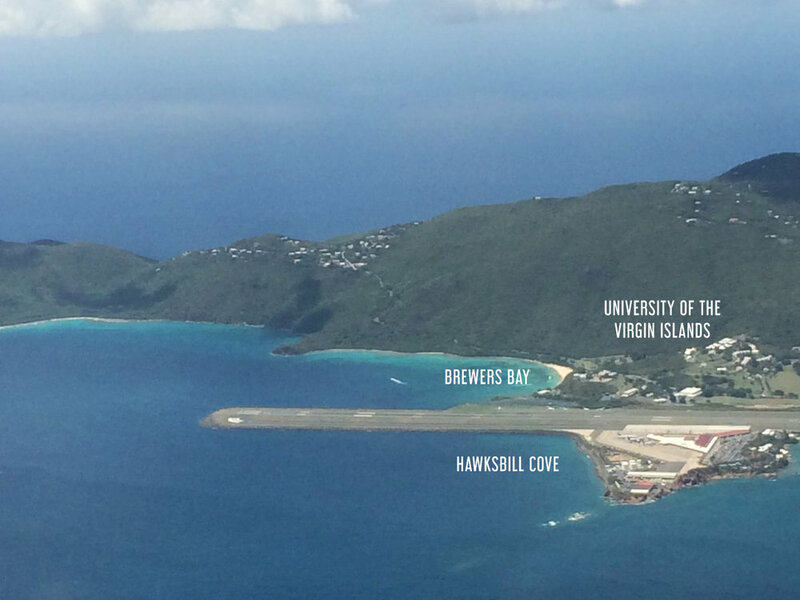 UVI and its Center for Marine and Environmental Studies (CMES) sits adjacent to Brewer's Bay and Hawksbill Cove, two bays with an abundance of Caribbean hawksbill turtles. This means UVI, and students in the MMES program, have the unique opportunity to study these animals in the wild. And that is exactly what Dr. Paul Jobsis and his team of turtle researchers were doing in July and August of 2017, the summer just before the storms. The acoustic transmitters, like the one seen above, are about the size of an AA battery. They will continue to ping a turtle’s location for up to a year or more. Attaching transmitters to the turtles’ shell is painless. Tracking the hawksbill turtles to determine their habitat usage and home range is done with the use of acoustic receivers and transmitters, a standard underwater tracking method. Acoustic transmitters which are about the size of a double AA battery are attached to the turtles’ shells. These transmitters emit a signal every 60 seconds to record the turtles’ location on receivers installed throughout the Bay. When this information is downloaded, researchers are able to document the turtles’ movements down to nearly every minute over periods of months or even years. At the time Hurricane Irma struck St. Thomas there were eleven hawksbill turtles with acoustic transmitters, most of which had been tagged just a few weeks earlier. The results of tracking these eleven turtles are simply amazing. Much to everyone’s surprise, following the storms, the researchers were able to recover all but two of the acoustic receivers, and even more amazing, all 11 turtles stayed within Brewer's Bay and Hawksbill Cove during Hurricane Irma. While the noise from the storm did reduce the number of acoustic signals recorded, all the turtles were recorded before, during and after the storm. “We had 100% retention of the tagged turtles in the these areas, and that is simply amazing. That a highly mobile species, one that can traverse entire ocean basins, would choose to stay within these areas and endure hurricane-force waves rather than leave the area is extremely intriguing,” said Dr. Jobsis. Seen above, Hawksbill Cove and Brewers Bay are a preferred habitat for juvenile turtles. They especially love to hide in the pilings that make up the runway. What's even more intriguing? They did it twice. Yes! Unbelievably, when Hurricane Maria clipped St. Thomas, the same 11 turtles remained in the Brewer’s Bay and Hawksbill Cove habitats transmitting their location, and their depth. This is an amazing data set that is totally unique. Jobsis and his team are currently working on a research publication describing the turtles’ movements before and after the storms. 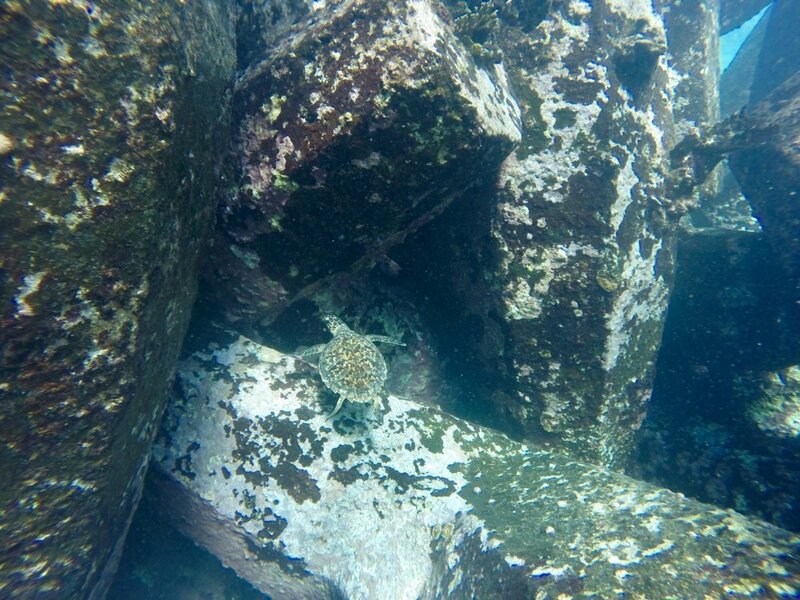 Preliminary results show how important foraging habitats are to hawksbill turtles: important enough that they would endure two hurricanes rather than move away from their foraging grounds. They say timing is everything and in this case that would be correct. The acoustic transmitters attached to the hawksbill turtles in July and August of 2017 were intended for another project designed to confirm the turtles’ home range. The unexpected arrival of the storms fortuitously led to the first documentation of hawksbill turtle behavior as it relates to site fidelity, hurricanes, and hurricane behavior. “Hawksbill sea turtles present in reef habitats are a sign of a healthy, functional habitat and if climate change predictions are correct, calling for an increase in the frequency and strength of Caribbean hurricanes, then these results speak well of the resilience and importance of foraging habitats like Brewer’s Bay and Hawksbill Cove to juvenile hawksbill turtles,” said Dr. Jobsis. For now, we have gained critical insights into how these critically endangered turtles behave and survive huge storms.